How much is your Hangout worth? If I had a dollar for every time someone asked me how I was going to “monetize” my Hangout, I’d be a rich woman. With emerging technologies, the pressure to figure out a way to make money on this new platform is intense. For some businesses, if something doesn't hit a financial grand slam immediately, it’s benched. I hear routinely, “Sarah, that’s great you’re able to talk with your audience live during a newscast but how are Hangouts going to benefit your station’s bottom line?” Well folks… I think I've figured out a way to monetize my Hangouts….in a way that would make even Robin Hood blush. 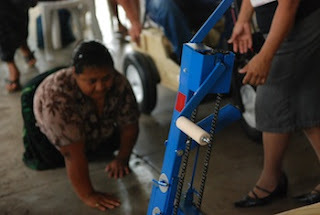 A few years ago in Guatemala, I watched the 8 year old boy pictured above crawl through vomit on the floor because his family couldn’t afford a wheelchair. In 2007, I met a mother in Vietnam who’d been carrying her son in her arms for 31 years because he had no other form of mobility. These are just two of the millions worldwide who are part of “The Culture that Crawls.” They are victims of landmines, poor nutrition, crocodile bites and agent orange. They are spat upon, looked down upon and in some countries, all but forgotten. What do these people who crawl have to do with monetizing Hangouts? Fifteen years ago out of a one stall garage in Columbia, Missouri, a gentleman by the name of Mel West built a mobility device to navigate places where wheelchairs can’t go for instance in the mountains or the jungle. All it took were three wheels, a few pieces of wood, a hand crank, and a chair. Today, it’s a called a P.E.T. cart or Personal Energy Transportation device. Initially, this device was intended to mobilize one man in Zaire, Africa. Fifteen years later, with the help of volunteers, he's mobilized more than 30,000 people in 93 countries worldwide. Even though it was a tiny one-car garage, Mel used his platform for good. 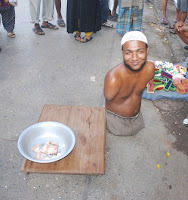 When I first created my Google Plus account back in July, I was drawn to photos taken by +Firoze Shakir. I couldn't take my eyes off of his stream because his images reminded me of others I've met who live on the ground in poor countries. It was as if his pictures were speaking to me. A photographer in Mumbai, Firoze routinely photographs street people, many of whom had lost arms and legs and lacked adequate mobility. Firoze’s images of people crawling shared alongside Google Plus posts about the new iPhone, stood in great contrast to me. It made me question the true value of what I was sharing. Whether it's one G+ follower or one million, if you have the ability to respond, then you have responsibility. Use your platform. Join the Plusketeers. 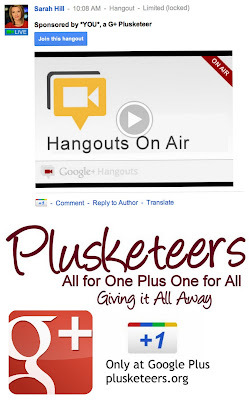 The Plusketeers are a group of individuals from around the world who met in Google Plus Hangouts. You can join us by using your platform to share stories about people on the bottom of the world's pile of human misery and ways we can help them. Today, along with the leadership of a group of G+ Merrymen, we're launching a million dollar Plusketeers Challenge….a way for all of us to realize the true value of the G+ space. We’re monetizing our Hangouts alright…..but instead of turning over everything to the Sheriff of Nottingham, we’re giving it all away....100 % to charity. You can contribute to the cause here or choose your own cause under the “G+ Plusketeers Challenge", help us crowd source a logo, and share this blog post through G+ and other social networks. Monetize my G+ Hangout by sponsoring the On-Air Text Announcement for $250, the price of a P.E.T. cart. Hangout Text appears in stream of my G+ Followers. Donate to my cause on our Crowd Rise Page. There, you can also donate to other Plusketeers Challenge causes like Camp No Limits & Honor Flight. Donor names are added to our donation scroll. Seek out corporate sponsors who smell like rich mahogany and many leather bound books. I hope mine is worth a million dollars, enough to buy PET carts for 4,000 people but it's not just my cause. Whatever your passion…whatever your Nottingham, we’re asking you to take up arms with us in the Sherwood Forest. All for One and Plus One for All. We may take a few arrows but using Hangouts for anything less….would be an error. A big thanks from me as well! Wonderful post and concept. And to all who would ask the question about monetizing your G+ Hangouts.....consider your reach. I live in Connecticut. I see/read/follow your newscasts more regularly than I do the ones in my geographic region. I'm right in between NY and CT metro areas, so have lots of choices. 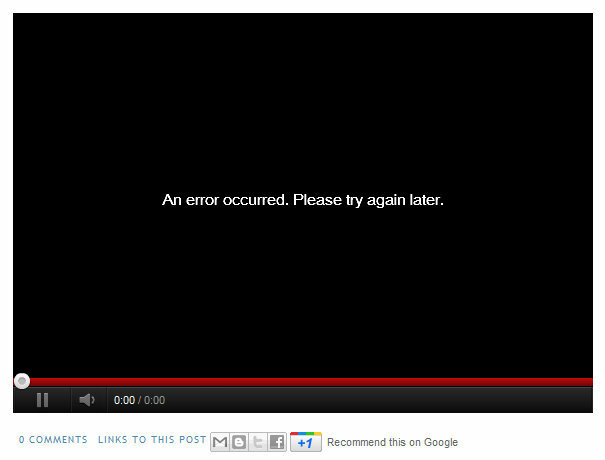 BUT my media of choice is ONLINE, not the traditional television. Your reach and impact are far reaching. You can never, will never know all the ideas you spark. This being just one great one....but there are other spin off ideas what stem from your enthusiastic adoption. I too started with G+ in July 2011. It's amazing to see how it pushed us and then we pushed it. We've grown together. We have grown together Dan. It will be interesting to see how the space grows and what it can accomplish in the future. Face to face interaction is very powerful. Keep in touch..